She’s the most famous murder victim in the country. What if she’s not dead? 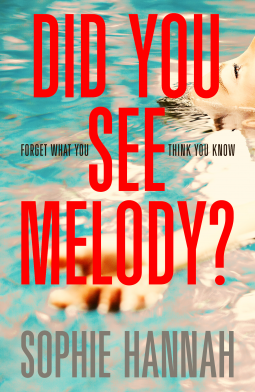 Did You See Melody? is a different kind of Sophie Hannah novel. It is a stand alone. It is pure psychological suspense, with a chilling hook and a killer central mystery. It combines Sophie’s critically acclaimed writing with a pacy and twisty plot. So, I was expecting it to be a gripping, tense and intriguing mystery. But I became increasingly disappointed as I read pages and pages of description of the five-star Swallowtail Resort and Spa in the foothills of Camelback Mountain, Arizona at the beginning of the book. I like description but this was far too much even for me. It’s like reading a promotional article for the resort. It picked up pace a bit when the subject of Melody was introduced. She was seven when she disappeared and although her body had not been discovered her parents were tried and found guilty of murdering her. Cara has left her husband and two children at home in Hertford in England without telling them where she was going, but leaving them a note saying she’d be back on 24 October. She’d booked herself into the Swallowtail and arrives, exhausted from her journey only to find that her room is already occupied by a man and a young teenage girl. However, the receptionist is extremely apologetic and settles her into a casita with her own private infinity pool at no extra charge. The first hint about what had happened to Melody comes the next morning when one of the guests announces that she’s seen Melody and eventually Cara’s curiosity is aroused and she discovers the tragic story of Melody’s murder. Cara wonders if the girl she’d seen the previous night was Melody. At first Cara’s reason for leaving home as she did is not explained and when it was I was less than impressed and I didn’t really warm to her character. From that point my own interest in the story picked up as the details of what had happened to Melody are gradually revealed as Cara talks to Tarin, a fellow guest, reads accounts on the internet and excerpts from the TV talk show, Justice With Bonnie, hosted by the truly terrible Bonnie Juno. Bonnie is described as a legal commentator and I really disliked her and her interference in the case. There is quite a lot of hyperbole and contrasting depictions of both the American and British characters, which made me wonder if this is a spoof, as really, most of the story just beggars belief. It’s far-fetched, contrived and over complicated. But once I’d got past the lengthy opening section I did want to know what happened next and it is in the last few pages of the book that I found something that really did send a little shiver down my spine – and left me wondering just what had really happened to Melody, and what would happen next. My thanks to NetGalley and Hodder & Stoughton, the publishers for a review copy. I’ve found myself increasingly less convinced by Hannah’s last few books. I think I am going to give this one a miss. I was in two minds about reading this book, and I probably won’t read any more of her books.